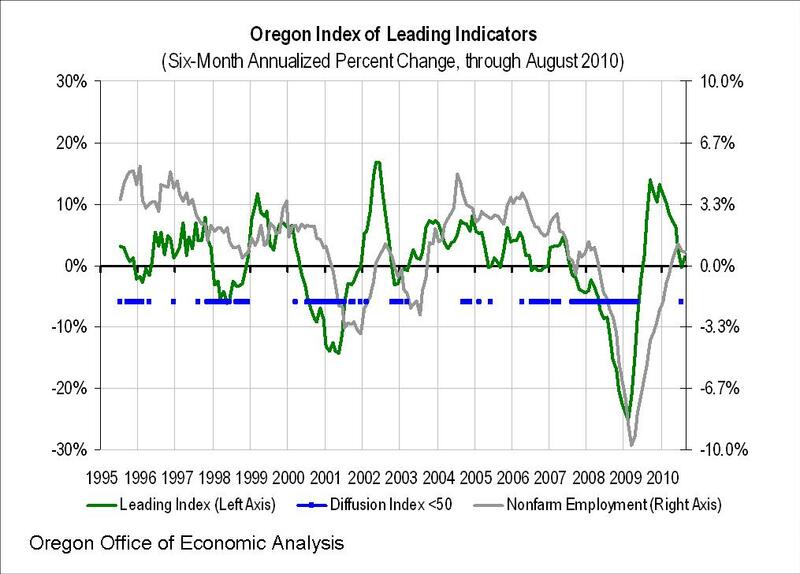 In August 2010, the six month percentage change in the Oregon Index of Leading Indicators was 1.5 percent, following a revised 0.2 percent decrease the prior month. July’s decline, previously estimated at 0.0 percent, marked the first negative value for the Index since June 2009. One a single month basis, the Index declined for three consecutive months through July, however OILI increased in August. Employment, on a six month annualized basis, has returned to the positive for the past five months – that is, employment in each month since April has been higher than the corresponding month from October through February. While only three indicators registered positive values in July, six were positive in August. The largest positive contributor to the Index remains Industrial Production, while the Oregon Dollar Index, Withholding, Help Wanted, Building Permits and Air Freight also increased. The Semiconductor Book-to-Bill ratio declined over the past six months, however it still indicates positive news for the health of the overall industry as bookings continue to outpace billings, which bodes well for Oregon’s Silicon Forest. Consumer Sentiment is the largest negative contributor. All other indicators are negative. The overall stagnation of the Index in recent months does not bode especially well for the Oregon economy in the coming months. Similar to the nation, expectations are for a continued economic soft patch through the end of the year. Our office’s OILI is methodologically consistent with the U.S. leading economic index series produced by The Conference Board and also the University of Oregon Index of Economic Indicators.